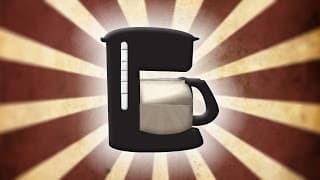 How Long Does A Coffee Maker Take To Brew Coffee? Wondering if your coffee pot is taking longer than it should to brew a pot of coffee? Chances are that your coffee maker is just fine. It should take anywhere from 6 to 12 minutes to brew (unless you are using a single cup coffee maker like a Keurig). But anything faster than that and your coffee is probably going to taste like junk! Let me tell you why – read on a bit please. –> Click here to jump to the Keurig section of this page. –> Click here to jump to the French Press section of this page. For starters a single cup coffee maker will take only a little less time to brew than a larger drip coffee maker. The reason for this is the heating element. To brew coffee the heating element must heat coffee up to near boiling otherwise the flavor of the coffee will be negatively impacted. It doesn’t take as long to heat up 10 ounces of coffee in a Keurig as it does to heat up 6 cups of coffee in a larger drip machine but both machines still have this bottleneck. More – There are a few single cup coffee makers that make coffee in under a minute. Here is a list of ultra fast single cup coffee makers. How Much Time Should It Take To Make Coffee? In short a good coffee pot will heat water all the way up to the highest temperature possible before it starts running the hot water over your coffee grind. It usually doesn’t take much longer than a couple minutes to heat water up, even if you are brewing an full 12-cup coffee maker. Brewing coffee in a drip coffee maker takes so much longer mostly because of the drip process. Because water can run so quickly through a filter basket good coffee makers will slow this process down by sending a slower stream or a rainfall of water over the basket instead of a flow. This slows things down but only so that the coffee can brew properly. If the water flowed to quickly into the filter basket it would either back up and overflow or the water would flow to quickly through the grind leading to under-extraction of coffee flavors. A good drip coffee maker will always take anywhere from 3 to 10 minutes or so to do a full drip cycle depending on the volume of water it is running through the filter basket. If it went any faster the taste of your coffee wouldn’t be up to the quality standards you’d like. Many fast brew coffee makers only brew in 3-5 minutes. In some cases these fast brew makers have a reservoir of water that is on standby and already hot. Some may compartmentalize the water that is heating up resulting in some water reaching full brewing temperature before the rest. This means the brewing time is shortened by the amount of time it takes to heat the water up – all the machines have to do is drip the water over your grind in the filter and this processes can’t be sped up. >> Here is a short list of some crazy fast coffee makers. Other machines (generally poorer quality machines) will start brewing coffee while the heating element is still warming up the water. This results in a faster brew time but a less tasty cup of coffee. In cases like this it is not uncommon for the first few cups of coffee brewed to be much lower in temperature than the last few cups, and more bitter too. Here’s a fun exercise for you to experiment with. Start brewing a pot of coffee and have the first ounce or two of coffee go directly into a mug. Then replace the mug with your carafe and then wait until the pot if half brewed. Now place a second mug under the flow to grab another ounce in your second cup. Once you have your two one-ounce cups of coffee let the rest of the coffee drip into the carafe like normal. Taste the difference between the first cup and the second cup. You will probably find the first cup to taste terrible compared to the cup that came from the middle of the brewing cycle. The reason for this is the temperature of the water entering the filter basket. If it is not heated up all the way the first bit of coffee will under-extract and taste terrible. The simple fact is you don’t want your coffee pot to start brewing too fast. It’s just not going to taste good. Assuming you care about the flavor of your coffee and you tend to brew pots that fall in the 5-8 cup range you shouldn’t be concerned with a coffee pot that brews coffee start-to-finish in 7-10 minutes. For larger pots or those machines that are meticulous about heating the water prior to brewing you may even find some decent machines that take even more time from beginning to end – maybe up to 10 minutes or a bit more. You are unlikely however to ever find a 5 minute brew cycle that turns out really well for a full pot of coffee. Alternatively if you decide to try yoru hand at making French press coffee then you can usually cut your coffee making time down to five minutes or so. Just follow these french press instructions and you’ll have better coffee faster. As noted above single cup systems have much less water to heat up so it is a bit faster. They also have a lot less water to slowly drip over grind so they are considerably faster. From start to finish it is not unreasonable to have a cup of coffee ready to go in under two minutes. The fastest I know of will get the job done in less than one minute! For Keurig coffee makers they will keep the water hot all the time if left on. This is a bit of a power drain and a strain on the heating element which can shorten the life span of your coffee maker but nevertheless if the water is hot constantly in a hot water reservoir then the brew cycle will start immediately when the “start” button is pressed. Coffee wouldn’t take more than a minute under this scenario. Check out this fun little video showing how a Keurig can brew a cup in roughly 30 seconds if the water is ready to go at the start. Generally speaking the french press is probably the best method to brew coffee in my opinion and no matter if you are making a small coffee press amount or brewing in a really large french press the brew time is about the same – 4 minutes from the time water is ready to brew. To brew in a french press you need that water boiling on the stove before you pour it into your press pot. Again, water getting heated up is a bottleneck that will vary for every person. Water boils faster at higher elevations and slower for many cooktops that take longer to heat up in the first place. Once your water is hot enough then you pour it into the coffee press and let it steep for 4 minutes. Some people may like it steeped in three but four is standard. As you can see, it’s easy to make coffee faster but you don’t want it brewed too fast; it just won’t taste good. Give your coffee time to brew and you’ll be thanked by a better tasting cup of black gold.